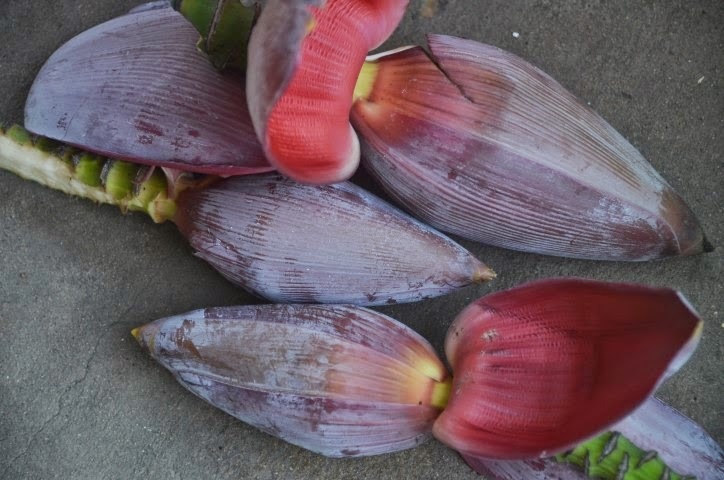 Banana blossom, also known as banana heart is the purple tear-shaped fruit that is usually found hanging off a banana cluster. 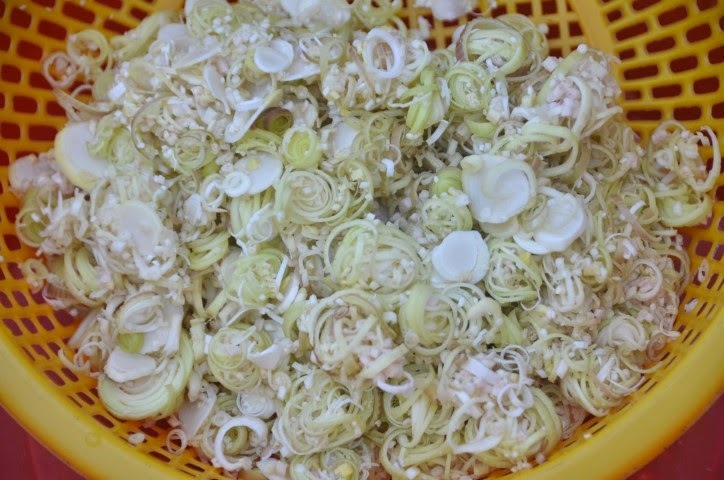 In Vietnam the finely shredded banana blossom is used in salads and to garnish and eaten in soups. It has a mild flavor and I have used them in stir fried dishes in the past. My mother said she has never heard of anyone stir frying banana blossoms before. I told her neither had I! I had some left over and did not want to waste it. 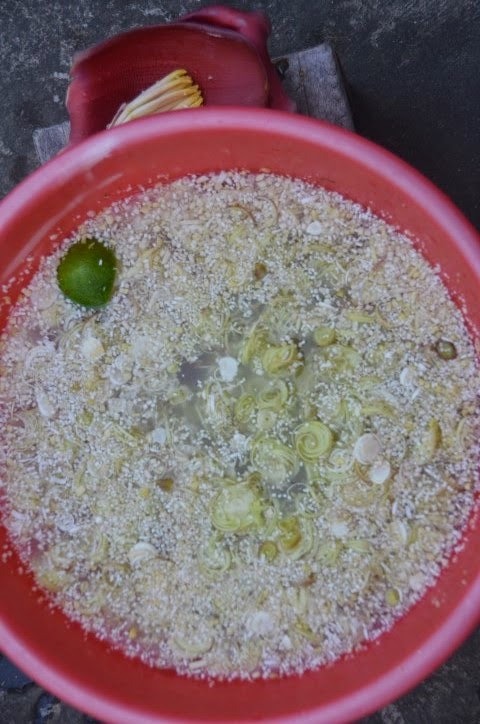 The key is that the shredded blossom must be soaked in lemon or lime water to rid of the sap, bitterness and to prevent it from turning black. When the cut blossom is oxide with the air it will turn black immediately. 1) Fill a large container with cold water and lime or lemon juice. 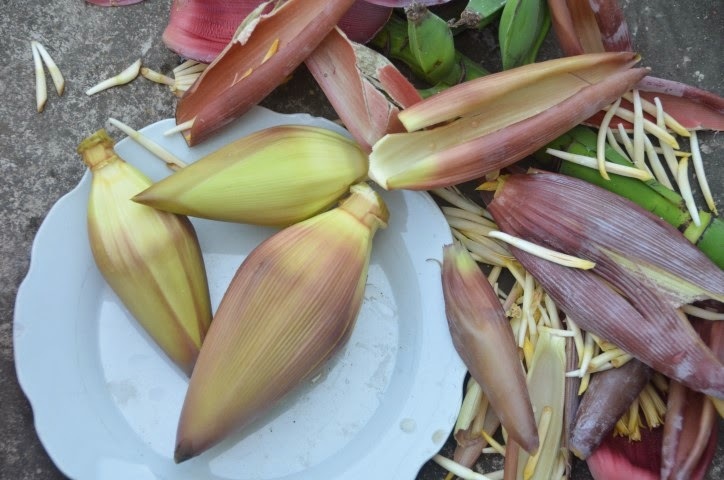 2) Peel off 3-4 outer layers of the banana blossom bracts (or petals). 3) Cut the blossom in half lengthwise. 4) Core each blossom half. 5) Thinly sliced each blossom half and put in water immediately. 6) Repeat the same step for the other blossom half. 7) Let soak for 4-6 hours or overnight (for some variety of blossoms it is best to soak overnight). 8) Remove the purple blossom, drain and squeeze out excess water before eating. so I take it hiking in the tropical wilderness! *The banana blossom is not so readily available in New Hampshire. However, you may be able to find them in some Asian grocers. *I prefer to soak the blossom overnight for convenience and best result. *Save the nicest looking outer blossom bracts in the refrigerator to use as bowls or for decorative use later. The last image (see above) has two blossom bracts that I saved. *If you are using the banana leaves as your work area (as pictured above), make sure to clean them by wiping the leaves gently with a wet cloth or paper towel. *The stain from the banana sap is difficult to remove. Avoid wearing your best clothes for this procedure! **Addendum: Below are a few updated photos taken in Vietnam (2015). These banana blossoms came from a banana variety (known as chuoi hot in Vietnamese) that has black round seeds that resemble whole black peppercorns (found inside the flesh). People in Vietnam eat the raw green banana slices wrap in noodles and salads. 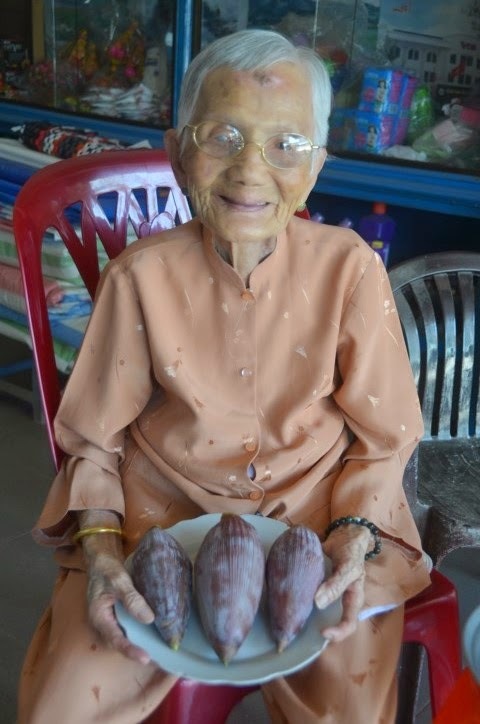 The ripe bananas are edible but they are not so popular. The young tree is edible but that will be covered in another post! 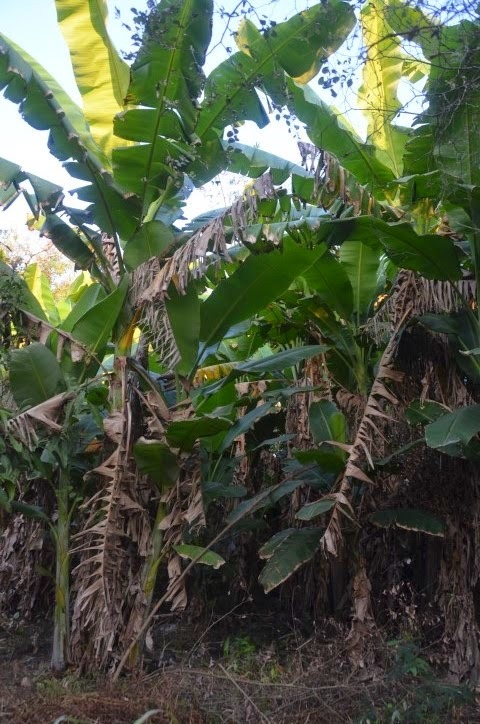 My late grandfather enjoyed eating them and he planted this variety of banana trees (see below) on his land. My relatives still can enjoy them to this day. i always wondered how to make these. Hi Cindy, thank you for your comment. I hope you try it! Pls let me know what you think and what you have decided to do with it. 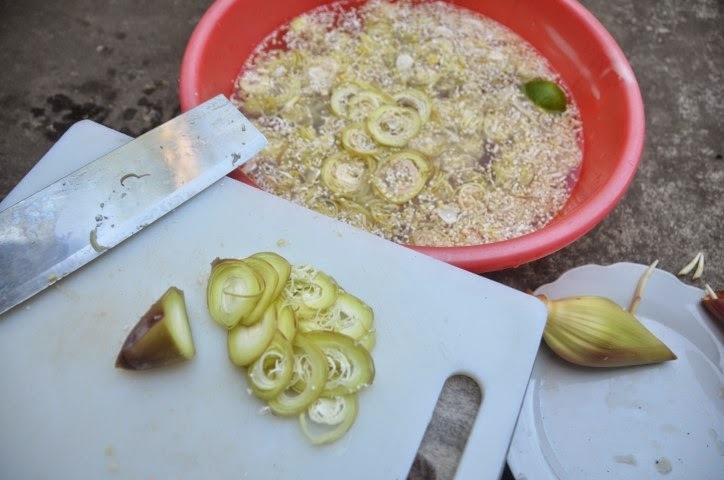 I like using the banana blossoms in stir-fries, salads and soups.